Qjames poorly made "Broke in half the first time i used it!" 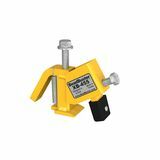 Dargan - Puyallup, WA, USA Great Product "The XB-455 Bead Breaker takes the hassle out of ATV tire changes. I had all four tires on my wife's ATV changed inside of an hour. It's a very simple to use and fairly rugged tool. I highly recommend this tool if you want to change your own ATV tires."